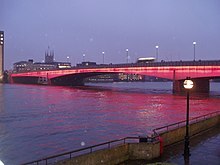 Several heestorical brigs named London Bridge (Scots: Lunnon Brig) hae spanned the River Thames atween the Ceety o Lunnon an Southwark, in central Lunnon. The current crossin, which opened tae traffic in 1974, is a box girder brig biggit frae concrete an steel. This page wis last eeditit on 11 Juin 2017, at 12:01.